Be sure to attend this HBS-hosted Q&A Session with Gehl and Porter! The American political system has become the major barrier to solving the important challenges facing our nation. 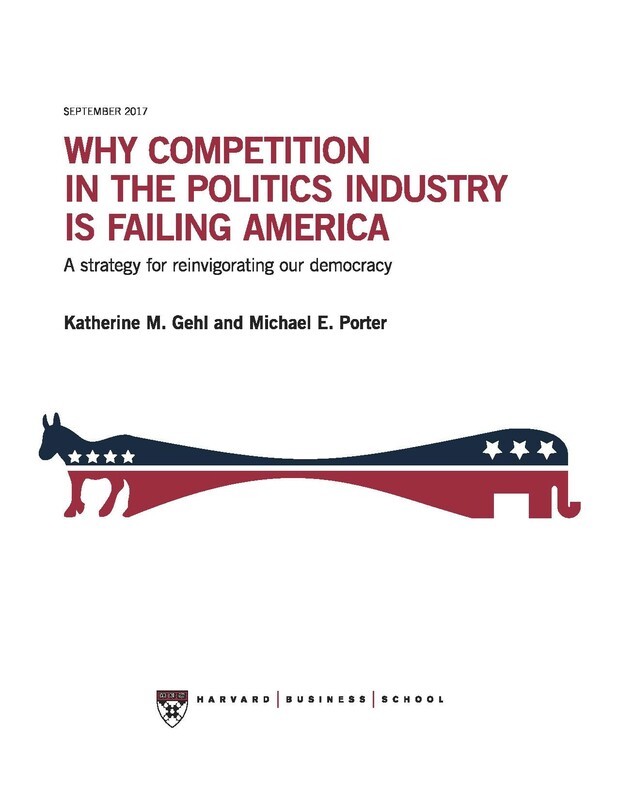 To understand why, Katherine Gehl and Michael Porter applied a new analytical lens – the lens of industry competition – in their 2017 report “Why Competition in the Politics Industry Is Failing America: A Strategy for Reinvigorating Our Democracy.” Their analysis views our political system not as a public institution, but as an industry centered on two private, gain-seeking actors: our two political parties. The parties and their allies have optimized the industry structure to serve their own interests. The end result is unhealthy competition that fails to advance the public good. In this session, Gehl and Porter will use this framework to introduce their cohesive reform strategy to restructure the politics industry, change incentives, and restore American democracy. You will not want to miss this event! Thursday, March 28th from 6-9pm PDT.